Structure from Motion Toolkit is a complete photogrammetry solution based on open-source software. This toolkit is designed to be used on a 64-bit Windows OS with an Nvidia 3D card (tested on Windows Vista/7 and Nvidia 8800, 9800, 285, 465, 470). BundlerFocalExtractor: extract CCD width from Exif using XML database. BundlerMatcher: extract and match feature using SiftGPU. Bundler: http://phototour.cs.washington.edu/bundler/ created by Noah Snavely. CMVS: http://grail.cs.washington.edu/software/cmvs/ created by Yasutaka Furukawa. PMVS2: http://grail.cs.washington.edu/software/pmvs/ created by Yasutaka Furukawa. BundlerViewer: Bundler and PMVS2 output viewer based on Ogre3D. BundlerToTracking: generate file to be used for AR tracking. BundlerToPly: generate ply file from Bundler output (indexes of 3D points are store in normals). BundlerCleaner: removed 3D points from the tracking file according to ply file [beta]. Source code: github repository (MIT license). Have you done any 32-bit version of BundlerMatcher? I am very curious about cmvs, but I only have Vista 32-bit. The Photosynthtoolkit is very good, but I miss cmvs. Olof: I don’t have compiled a 32-bit version of BundlerMatcher because the memory limitation of 32-bit app are too low. Moreover SiftGPU is using lot of virtual memory so it doesn’t let that much memory space to handle lot of feature descriptors… But I think that I’ll have a good news about CMVS and PhotoSynthToolkit in a couple weeks… stay tuned! Ok. Thanks for the reply. CMVS and PhotoSynthToolkit sounds like a very nice combination! I have installed and attempt to run this tool kit. However I get a Microsoft LScript runtime error when using the supplied sample images. The error is file not found code 800A0035 line 330 char 3. Any help working this issue out would be greatly appreciated. I am having the same error on line 330 Char 3 File not found. I am on windows 7 x64 and have a nvidia graphics card. I am having the same error on line 330 Char 3 File not found. I am on windows 7 x64, but I have a Radeon graphics card. Hi there, any news about the error on line 330 char 3? I just moved to a new 64bit computer but I keep getting this error message. I copied everything on C but nothing. I also moved the photos to c:\photos but still no success. Source: Microsoft JScript runtime error. [SifterApp::ReadGeometricConstraints] Error: number of images don’t match! [BundleAdjust] Error: no good camera pairs found! @Brad: I’ve taken a look at your log files and my guess is that there is not enough overlap between your pictures. 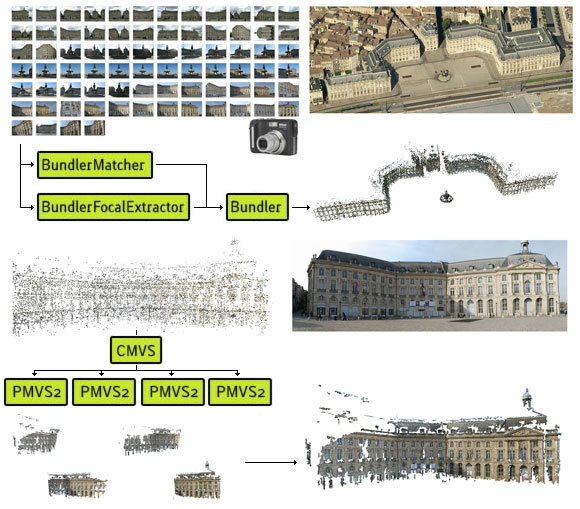 Have you tried to use photosynth with your dataset? @Ara: well, you should use SFMToolkit instead: the toolkit you are referring to was created before. BTW do you have tried PhotoSynthToolkit or even better 123D catch? Hi. I have downloaded the kit. When I try to run Bundler script on the images error comes up at line 3. . .
My computer does not support GPU.But I want to use BundlerToTracking.exe to generate track files.What should I do?Thank you! @Lee: BundlerToTracking was designed to produce a binary file needed for my outdoor augmented reality tracking algorithm. I doubt that it will be useful to you without the corresponding tracking code… (which is not open-source). How can i solve this . if i want to add camera ccdwidth to extract_focal.pl. How can i do that in windows? @swee: You just need to add the ccd width of your camera in “cameras.xml”. You can find easily the ccd width on http://www.dpreview.com. Do you have any suggestions? The application isn´t really installed, is it? So I can´t reinstall it, right? Doest the camera you take the photos with have to be ccd, or does a cmos camera work as well? I also get a Microsoft LScript runtime error when using the supplied sample images ET. How can i fix this priblem? I am really interested in your work. I am studying it. But is there any doc or help to follow, cause the Photogrammetry forum has been removed. And I can’t get it work on Window 10, even in the compatibility mode.